Storing cooking tools stretches many drawer organizers too far. 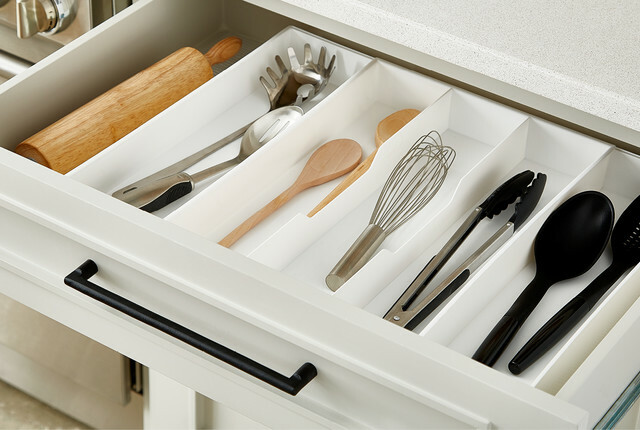 The Expand-a-Drawer Utensil Trays are specifically designed to accommodate the oversized and long utensils required in contemporary kitchens. Our Expand-a-Drawer Organizers adjust to the width of your drawer for a custom fit in an instant. Expand-a-Drawer Utensil Trays is rated 4.6 out of 5 by 47. Rated 5 out of 5 by ContainerStoreFan1967 from Container Store Success I measured my top kitchen drawer before arriving at the store and worked hard to find exactly what my deep silverware drawer needed. I combined the White Mesh Food Storage & Lid Organizer with an Expanded-A-Drawer Utility Tray to make my drawer dream come true! The expandable option for the tray is awesome! I love that the tray fits snug and every square inch of my drawer is usable! Thanks so much Container Store. You never let me down! Rated 5 out of 5 by Annodms from Expandable drawer insert Received product as described and liked it was an American Made product. Rated 5 out of 5 by AndreaD from I ended up buying the narrow expandable utensil tray for my silverware drawer and it's perfect! The inside width of my drawer is 10" and even though that's not enough room to use the expandable part, I can still use the 5 main compartments. Rated 5 out of 5 by AJM88 from Great to get organized with! I purchased two of the original size to corral utensils in two kitchen drawers. These are extremely useful to help locate just the right tool in the kitchen. Rated 5 out of 5 by doctorliz from Great kitchen drawer organizer Price is reasonable to make your drawer organized! I was worried with the plastic material might look it cheap but it turned out very well. Rated 4 out of 5 by MelanieO from Helps I think the main problem I have is not the fault of the product, but just because my drawer is very shallow and I have a lot of utensils. I put this product in my drawer and organized everything as best as possible. It's pretty crammed though, but I do like it more than before. It was pointless to use one of the expanders, so I put it into a different drawer to help with that one. It's not the most amazing organizational piece, but it's not bad. Rated 5 out of 5 by Gramma2 from Works Great! This is ideal for organizing my large spatulas, spoons and other cooking utensils in a pullout drawer in one of my kitchen cabinets. Before, everything was just "in the drawer". Now it is neat and easy to find what I want immediately. Rated 4 out of 5 by restongirl from Utensils tray. This is an excellent kitchen utensils tray for large, long tools. Not so good for small utensils, which tend to go astray under everything else. I had to get a silverware tray for smaller utensils. Rated 3 out of 5 by garyo from ok but not stable This item is adjustable, but it never really sticks together. The ridges which are supposed to hold the adjusted box together don't really hold together very well. I ended up taking them together. It works I guess but it's kind of hokey. Rated 5 out of 5 by ShannonT from Best Kitchen Utensil Organizer I am a huge fan of drawer organizers and have found this to be the best one for my kitchen drawers. They hold a lot of large utensils and also fill up large drawers really well without having to jimmy rig something to it will stay in place. Rated 5 out of 5 by crimsongem from Best Utensil tray ever purshased This tray is longer & adjustable for my utensils.I have a long & narrow drawer. that has been difficulty to find the tray I needed. Rated 5 out of 5 by trozum from Perfect for my needs I had looked high and low for something to corral my untensils in my very small condo kitchen. This was it; I should have started here first! Thanks Container Store! Please open a stores in the Kansas City Area; my kids are tired of me sending them to the St. Louis store to retrieve my order each time they come to visit. Rated 5 out of 5 by Cookies from Drawer organizer extraordinaire ! Purchased the expandable drawer organizer for my miscellaneous kitchen tools. Previously they were just tossed in a drawer. Finding what I needed always took time and was just plain aggravating. This has made the drawer neat, tools easily accessible, and such a time saver. Would definitely recommend this product! Rated 5 out of 5 by LMTallahassee from Great Drawer Organizer My daughter-in-law suggested I purchase this and wow what an organizer. Now my utensils stay in place and no more digging through the drawer! Rated 5 out of 5 by CarQueen from Works great We just remodeled our kitchen and the drawers are large. An average organizing tray just wouldn't work. I was glad to find this one, and once placed in the drawer it works great. My cooking utensils are organized and not sliding around in the drawer. Rated 5 out of 5 by coolStuff from Makes sense and works I bought this for its versatility. Originally intended for a narrow drawer (and this tray did fit nicely) I decided to use itfor a more wide drawer where this tray, expanded, was more beneficial for the mish mash in that drawer. This tray's been in use for about a week and is working out fine so far. Rated 4 out of 5 by act1 from Good inexpensive buy which fits the drawer of our size at home. Rated 5 out of 5 by tha503 from Very useful I purchased one of these for my kitchen utensil drawer. It makes finding what I need so easy, no more digging through the drawer! Rated 5 out of 5 by ALC65 from Just what I was looking for! I bought a couple of these to replace the original utensil holders that came with our new house. I was having a hard time finding an organizer that would use the whole space inside the drawer and then I found these. Perfect fit and I didn't have to special order one or find one and cut it to fit the drawer. Rated 5 out of 5 by bluelion from Just What I Needed This holds everything I need to use for cooking next to my stove. It makes it much easier to cook since I dont have to rummage through a pile of utensils! Rated 5 out of 5 by Lollie123 from Best In-Drawer Organizational Sytem EVER!!!! I bought this in-drawer organizer because we refinished the custom drawers in our kitchen and they are wider than standard drawers. This system is like magic, it adjusts to fit, has plenty of org space and makes finding my kitchen tools a snap. How I ever lived without one, I have no idea! Rated 5 out of 5 by Lilly65 from Love the versatility I have purchased several of these trays and love them. I'm using them in my kitchen pantry. They have really helped me organize my canned goods. Also have them in my kitchen silverware drawer and love that too. Rated 5 out of 5 by Kellymoo from Perfect for my messy utensil drawer This did the trick for my messy drawer. Very happy! Rated 5 out of 5 by MS88 from Smart product This drawer organizer was the perfect solution to my messy overflowing utensil drawer. I can now not only see everything I have and access it quickly, I can fit even more in the drawer! I love that it requires zero assembly and that it expands to the width of virtually any size drawer. Rated 5 out of 5 by cowboy from Expand a Drawer I just purchased 2 expand a drawers as I wanted to organize my kitchen. My cabinets were built in 1965 so I was so amazed the container store had items that exactly fit as i have not been able to find anything before. I love my drawers and it is so much easier to locate items when I am cooking. I would highly recommend this store to anyone wanting to organize any room. The employees are so helpful and have great items. Rated 5 out of 5 by Chrysanthemum from Great product This was the answer to my disorganized drawer of utensils. At the right width, I was only able expand one of the two extensions to fill the length off my drawer. Nontheless, I was able to fit all utensils and have been organized since. Rated 5 out of 5 by ChristineD from Perfect solution! I was frustrated with not being able to find a spatula, scraper or pizza cutter to save my life, despite the fact I own multiples of each. This utensil organizer was the perfect solution! It is long enough to house my multiple sizes of utensils, and deep enough to stack items. And the expanding size allowed it to fit perfectly into my drawer, while allowing me to choose if I wanted one additional large bin, or two smaller ones. Great product at a great price. Next up....the junk drawer! Rated 4 out of 5 by IAmOrganizing from Loved it! The drawer is perfect and very versatile. Whatever size your drawer is you can adjust it to fit your needs. It's lightweight and a no-brainer to assemble. I will buy more like it. Rated 4 out of 5 by mrsteeno from Doesn't lock Great for the price- the down side is that this does not lock in place after it is expanded like the Bamboo would. Go for the bamboo ones if you can afford it. What are the lengths and widths of the different compartments? Ever find yourself doing the kitchen drawer shuffle?